While the U.S. bishops ended up taking no concrete action regarding the sexual abuse scandals in the church during their Nov. 12-14 meeting in Baltimore, Archbishop William E. Lori told the Catholic Review he would not wait for the U.S. bishops to approve a code of conduct for bishops to ensure that he and the archdiocese’s three auxiliary bishops would be held to the same standards as other clergy, seminarians, employees and volunteers. “In almost every diocese, including the Archdiocese of Baltimore, there is a code of conduct, and so we are certainly bound … by that code of conduct,” he said. Furthermore, bishops are to be held accountable to what they pledged to do in the Charter for the Protection of Children and Young People and their accompanying norms, approved by the U.S. bishops in 2002. “In the charter and the norms, we set how we would handle cases, … we enunciated the standards of behavior that we expect of other clergy. 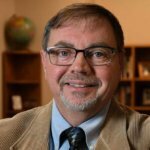 In our statement of episcopal accountability back in 2002, we pledged that we would hold ourselves to everything that is in the charter,” he said. The accountability statements the bishops were considering this year were “not a brand-new creation, but it comes from expectations you would already find in previous U.S. church documents as well as much of what has been written about the life and ministry of bishops,” Archbishop Lori said. But he also acknowledged the concerns of victim-survivors and that they “would have wished to see crisper and more definitive action on the part of the bishops this week. At the same time, I would want to assure them that the bishops were unanimous in their desire to move ahead with these matters,” the archbishop said. “I also would say that, in any case, these were simply first steps. And I think there will be many more steps to come, particularly in strengthening our outreach to victim-survivors,” he said. One of the more vibrant discussions at the meeting involved criteria on how to determine whether to publish the names of accused clergy in a diocese, with some bishops asking for guidance on what constitutes a “substantiated” or “credible” allegation. Several dioceses have published such lists recently, and others are considering it. In 2002, the Archdiocese of Baltimore was one of the first in the country to publish a list of accused clergy, and the list has been updated with new names in the years since. Archbishop Lori said he would welcome guidance on a national level with greater clarity on this. The bishops also discussed the situation of former Washington Archbishop Theodore E. McCarrick. The archbishop resigned from the College of Cardinals this summer amid allegations of misconduct. 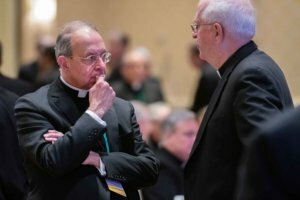 Dr. Francesco Cesareo, chairman of the National Review Board, a body of lay people that advises the bishops on sexual abuse within the church, told the bishops Nov. 13 that their response to the scandals had been incomplete and lacked transparency. The NRB chairman said the church is not in the same place as before the passage of the charter in 2002. “The church has done a great deal in this area since 2002. I think that’s important for people to realize: that the Charter for the Protection of Children and Young People has put into place important policy and protocols,” he told the Catholic Review, noting that evidence shows the number of allegations by current minors significantly declined versus before the charter was put into place. “A lot has been done but more needs to be done. And that’s why we are at the moment that we find ourselves in this church,” said Cesareo, whose full-time job is president of Assumption College in Worcester, Mass. All the bishops will gather in January 2019 in suburban Chicago for a retreat. In February, heads of bishops’ conferences from around the world will meet with Pope Francis in Rome. Then, the U.S. bishops will return to Baltimore in June for their spring meeting, originally scheduled for California. The spring meeting usually includes components of a retreat, but since the meeting will include extensive discussions and, it is hoped, votes on bishops’ accountability, the Baltimore location offers better logistics. Archbishop Lori said there is much to be done before the February and June meetings. He noted that Cardinal DiNardo has established a task force to refine the proposals and has asked each bishop to reflect on four action steps the bishops hope to take. “Secondly, we can look in our own dioceses and see what we can do. For example, in the Archdiocese of Baltimore, we have already said that we four bishops are subject to the Review Board, that any complaint against one of us goes directly to the Review Board. “I think the third thing we must continue to do is listening to our people, listening to their proposals, their thoughts, their anguish, their reflections and being out and among our people during this time of anguish and grief for the church,” the archbishop said.